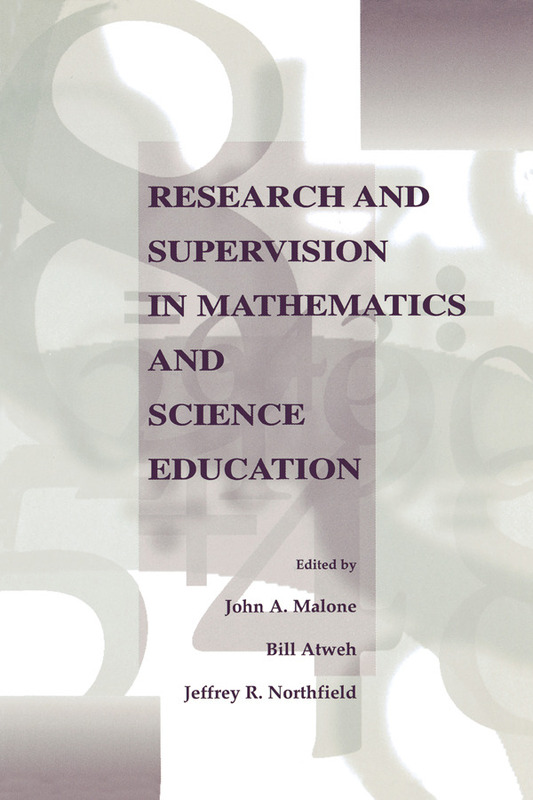 Research and Supervision in Mathematics and Science Education provides student researchers and their supervisors with information about both the essentials of planning, conducting, reporting, and publishing qualitative research, and the characteristics of quality supervision. It is focused primarily for postgraduate research students in mathematics and science education and their supervisors. It will also be of interest to students and faculty in other disciplines that use educational and sociological research paradigms. The volume builds on two phenomena of recent years: first, the increasing momentum of postgraduate research in mathematics and science education and, second, the resulting need of those involved for knowledge about doing research and about engaging in quality supervision. The decision to address both research and supervision in one volume is a response to the fact that faculty who supervise postgraduate research often are in need of resources covering not only aspects of project and thesis supervision, but also the knowledge to assist students in research design, especially in the qualitative field. Drawing on recent research and practice, the authors of the chapters in this book illustrate approaches and strategies that have been used successfully with, and by, postgraduate students. The book also has a strong future orientation, describing how postgraduate supervision and research will change as more and more students gain access to and make use of the vast array of technological resources now available. A necessary and unique addition to books in the field of postgraduate research and supervision, this volume's particular appeal stems from its practical approach, its creative future perspective, and the wide generalizability of the thinking and ideas it presents. "The text should be of value to virtually all groups which have an interest in the research enterprise, either as contributors (or potential contributors) or as consumers of the products. In addition, the educational community at large will find much of relevance in this volume." Contents: D. Williams, A Framework for Thinking About Research in Mathematics and Science Education. R. Zevenbergen, Ethnography in the Mathematics and Science Classrooms. J.S. Schaller, K. Tobin, Establishing Credibility and Authenticity in Ethnographic Studies. J. Truran, K. Truran, Using Clinical Interviews in Qualitative Research. R. Bleicher, Classroom Interactions: Using Interactional Sociolinguistics to Make Sense of Recorded Classroom Talk. P. Taylor, V. Dawson, Critical Reflections on a Problematic Student-Supervisor Relationship. G. Leder, H. Forgasz, J. Landvogt, Higher Degree Supervision: Why It Worked. L. White, Teacher, Researcher, Collaborator, Student: Multiple Roles and Multiple Dilemmas. F.E. Crawley, Guiding Collaborative Action Research in Science Education Contexts. J.A. Malone, On Supervising and Being Supervised at a Distance. W-M. Roth, M.K. McGinn, Legitimate Peripheral Participation in the Training of Researchers in Science and Mathematics Education. A. Begg, B. Bell, V. Compton, E.A. McKinley, Supervision in a Graduate Centre. T. Cooper, A.R. Baturo, L. Harris, Scholarly Writing in Mathematics and Science Education Higher-Degree Courses. J. Hourcade, H. Anderson, Writing for Publication. D. Squires, The Impact of New Developments in Information Technology on Postgraduation Research and Supervision. P. Rillero, B. Gallegos, Databases: A Gateway to Research in Mathematics and Science Education Research.